In this Photoshop tutorial, we'll learn how to quickly and easily add a dream-like infrared glow effect to an image, and we'll do it non-destructively using Smart Filters and adjustment layers so that when we're done, our effect will remain fully editable and we won't have damaged a single pixel in the original image. For best results with this tutorial, I recommend using Photoshop CS6 (which is the version I'll be using). 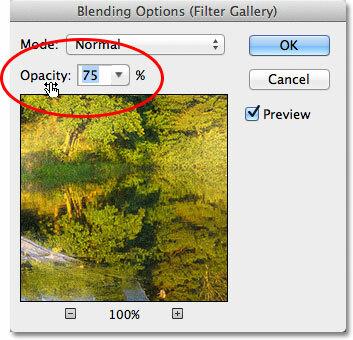 Clicking the Black & White icon in the Adjustments panel. 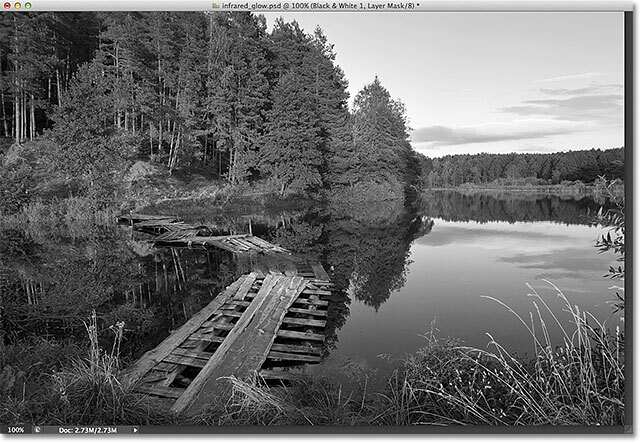 The Layers panel showing the Black & White adjustment layer. 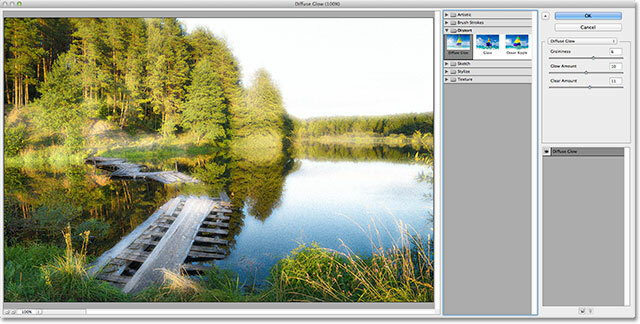 The image after adding the adjustment layer. Changing the Preset option from Default to Infrared. 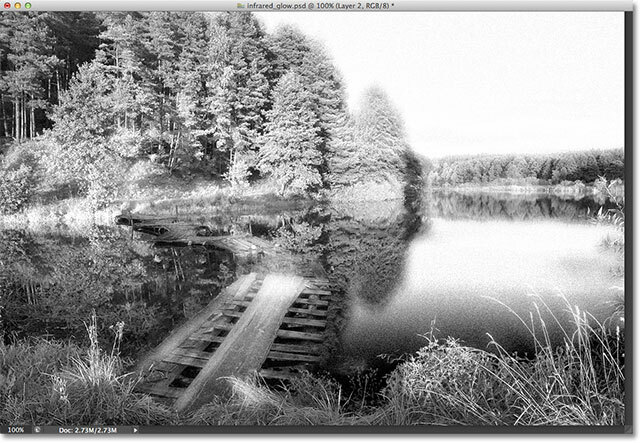 The image after changing the preset to Infrared. Dragging the color sliders to increase or decrease brightness in specific areas. The detail in the trees and grass has been restored. Choose "Convert to Smart Object". A Smart Object icon appears in the thumbnail. 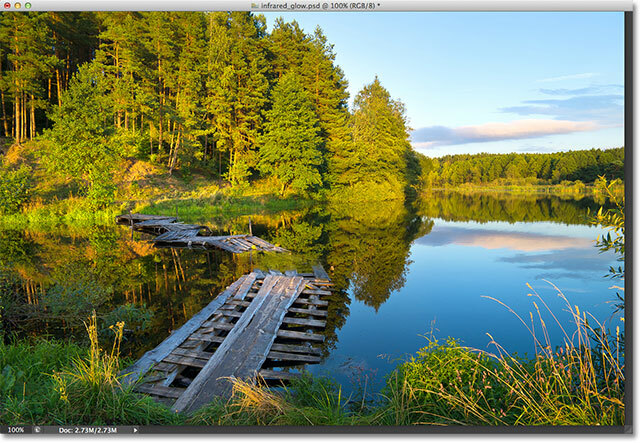 Press "D" on your keyboard to reset the Foreground (left) and Background (right) colors to their defaults. Choosing the Diffuse Glow filter from the Distort category. Right-click (Win) / Control-click (Mac) in the preview area and choose Fit in View. The image now fits inside the preview area. One thing you'll notice is that even though we just finished converting the photo to black and white, it appears in full color again in the preview area of the Filter Gallery. 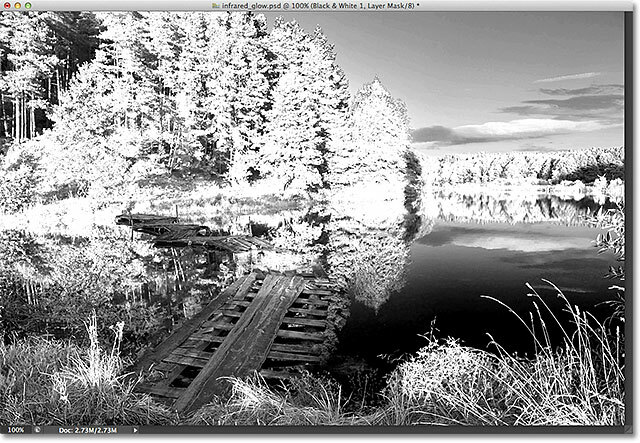 That's because the black and white effect is contained entirely within our Black & White adjustment layer, and we're applying the filter only to the Smart Object below it, so all we see in the preview area is the contents of the Smart Object (which holds the full color version of the photo). 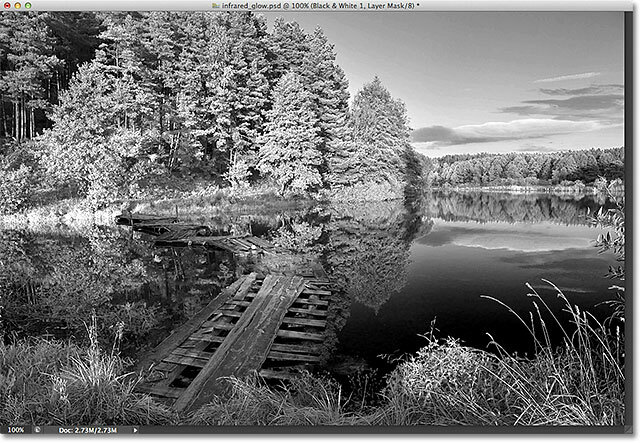 The Filter Gallery has no idea that there's a Black & White adjustment layer sitting above the Smart Object, but when we're done with the Diffuse Glow filter and close out of the Filter Gallery, we'll go back to seeing the infrared black and white version of the image in the document window. Use the Glow Amount and Clear Amount sliders to control the look of the glow. Add grain with the Graininess slider. The filter visibility icon below the sliders. The image after applying the Diffuse Glow filter. You may not need this step with your image, but in my case, the Diffuse Glow filter has blown out the detail in the sky, as well as some detail in the water. A simple solution to the problem is to lower the opacity of the Diffuse Glow filter to bring back some of the missing detail, and since we applied it as a Smart Filter, lowering the opacity is easy! Double-clicking the Blending Options icon. Lowering the Filter Gallery's opacity. The image after lowering the opacity of the Smart Filter. We can double-click on any Smart Filter in the list to re-open its dialog box and make any changes we need. Selecting the Black & White adjustment layer. Lowering the layer opacity to 90%. And there we have it! That's how to create a quick, non-destructive infrared glow effect using adjustment layers and Smart Filters in Photoshop CS6! Visit our Photo Effects section for more Photoshop effects tutorials!